Last Sunday Kyrgyzstan witnessed the outstanding event. For the first time in the history of post-Soviet Central Asia the republic had relatively free elections. Very democratically pushing and slinging mud at each other, five political parties, representing nearly all quite diverse local political elites, advanced into the parliament.. From now on, the future of the republic will depend on whether the winners are able to reach the common agreement. Many people rushed to call the elections in small mountainous republic as "free" (long before the announcement of official voting results): the interim President Roza Otunbaeva, US President Barack Obama, the observers from SCO and Europe and even local irrepressible human rights advocates. I am afraid no one really knows whether it was completely "free" elections. However, no centralized administrative mechanism was used for manipulation indeed although I still believe there was slight dictation. The parties in Kyrgyzstan are regional unions and tribal clans. It is impossible to monitor how "by the request of aqsakals" the electorate (hundreds and even thousands) gives votes for the certain candidate. The good news is that the elections did not involve mass protests, provocations and clashes. Getting used to the fact that as a result of any political opposition in the republic there may be armed people in the streets, the citizens could breathe freely when the polling stations finally closed doors. After common euphoria it turned out the results are different from what was expected. In the rally for seats in distressful parliament Ata-Jurt, the party of former "Bakiev’s" officials, came first. The victory of antagonists shocked the team of Roza Otunbaeva (Social-democrats and Ata-Meken). They were dreaming about totally controled legislative body. Overthrowing two presidents having blind faith in total support of population, they faced the protest and rejection of their policies. Selecting "Bakiev’s" officials, people de facto voted against the interim government. Against Roza. Today, the interim leaders are the outsiders while the republic is looking for new heroes. The top position is held by Kamchibek Tashiev, the leader of Ata-Jurt. He is the former Emergency Response Minister, de facto supporting the Nazi patriots. During the election campaign he promised to change the constitution towards authoritarian rule and bring back overthrown president Kurmanbek Bakiev that has been hiding in the woods of Belarus since April. His team consists of "Bakiev’s" officials and criminal power in the south, joined with middle level law enforcement officers. There also people from "north" in this party; for instance, Nariman Tyuleev – ex-mayor of Bishkek with quite controversial reputation, fired by new government, but still popular among the residents of Bishkek. The current ruling party – social-democrats (SPDK), headed by current president Roza Otunbaeva – came second. Ar-Namys, the oldest opposition party, headed by Felix Kulov, came just a little bit behind SDPK. The strong support of Kulov by Russia ensured high percent of votes predominantly from Russian and Uzbek population. Respublika, headed by Omurbek Babanov (the former deputy Prime-Minister of Bakiev’s regime), came fourth. The last fifth spot is taken by Ata-Meken with Omurbek Tekebaev that seemed to be the charismatic leader. 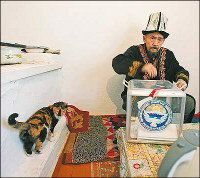 The architect of newly born Kyrgyz Constitution, pro-Western and pro-parliament politician, hardly gained 5% of votes. The dilemma is that each of the winners has 5-8 percent of votes. Considering the lowest attendance of elections in the last 20 years (about 55%), is not it the sign of "democracy in action"? As a result, each of the parties will gain no more than 20-25% of all seats in the parliament, deprived of the opportunity to form the majority of "like-minded" deputies. Not waiting until the announcement of official results, the newly born parties are discussing possible coalitions. They are doing it hectically in order to preserve seats and not to let president use one of her very few privileges – dissolve the parliament in case its total incompetence. It is already clear that all coalitions inside new Kyrgyz parliament are temporary. There are too many differences between the programs of the parties. The point is that Tashiev once said: "If Russians, Uzbeks or Turks say that they are equal to Kyrgyz or stay above them the country will collapse". Mr. Tashiev blamed Uzbeks and interim government in the Uzbek pogroms. Mr. Tashiev put efforts in order to promote the autonomous power in the south, de facto not subordinate to Bishkek. On the other hand, Felix Kulov, candidate number 1, supported by Kremlin, and even hosted by Dmitry Medvedev, is famous the vigorous supporter of presidential republic. He also made the appropriate public statements few times. Nonetheless, the program of Ar-Namys says different things: it clearly outlines the rejection of "presidential rule that became the obstacle on the way to development, the source of regional confrontation to the rule of parliamentary republic, where the wining party forms the government and bears full responsibility". Overall, there is a mess in the declared and real intensions. Such parliament is not creating conditions for "stability", promoted by local aqsakals and elder geopolitical brothers. The results of parliamentary elections do not make the domestic and foreign policies more clear. The political elites in Bishkek may face absolutely any kinds of coalitions (both voluntary and temporary) now. We can only guess how the real interests of future deputies will transform in the process of building coalitions. May be this is the nature of democracy? Daniil Kislov, Chief Editor of Ferghana.Ru information agency. The article is also published in Moskovskiy Komsomolets on October 13, 2010.